The HSS-12 dwarfs the Saturn’s model 2 control pad, yet has half as many buttons! Note: Interested in the Sega Saturn? Check out my reviews of the Saturn games D & D: Tower of Doom, D & D: Shadow over Mystara, Crows: The Battle Action, Nekketsu Oyako, and Warriors of Fate! Quick Saturn Controller History: Many different controllers were released for the Sega Saturn home console. The Sega Saturn used 8 buttons (in addition to the control pad and Start button): A, B, C, X, Y, Z, L, R). While the console, released in 1995, included a basic, well-made game pad (and later a 2nd release that changed some things up), Arcade Sicks were soon released to present an alternative way to play Saturn games. The Virtua Stick was the most common. It included all of the necessary buttons, plus turbo switches and an arcade-style stick rather than a control pad. 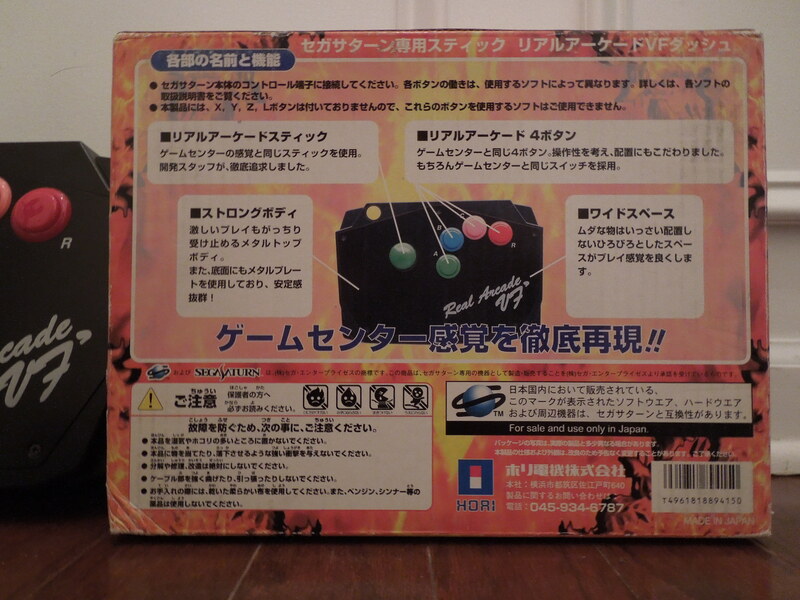 A second controller, the Virtua Stick HSS-0136, was also released (only in Japan). The HSS-0136, released by Hori, was huge and extraordinarily similiar to what you would find in an arcade. It included all 8 buttons, and they were large and round, like those on an arcade cabinent. Also, the control stick was clicky, much like those in the arcade. For many Saturn gamers, the HSS-0136 is the pinnacle of controllers for the Saturn. 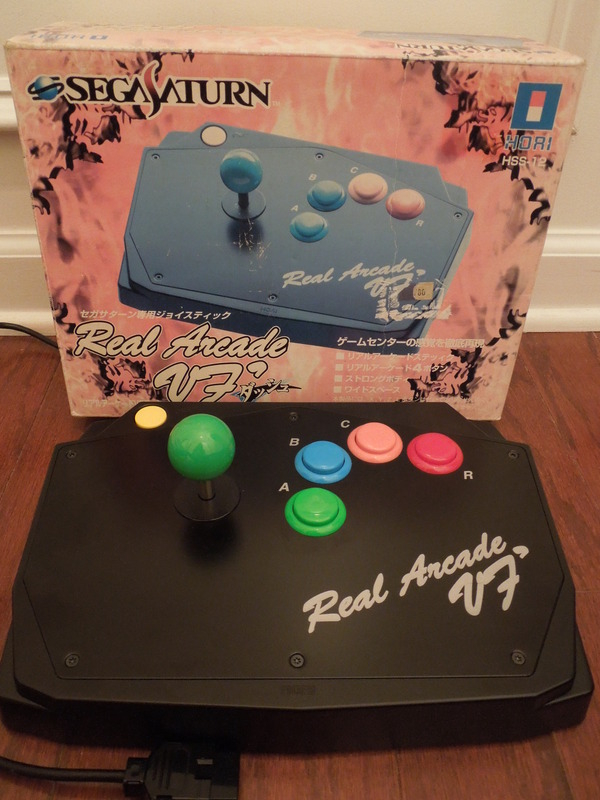 However, there was another arcade stick that is extremely obscure that was made for the Saturn and was only released in Japan – the Real Arcade VF Dash, model no. HSS-12, which was also made by Hori (a company famous for making great controllers) – this a review of that controller. 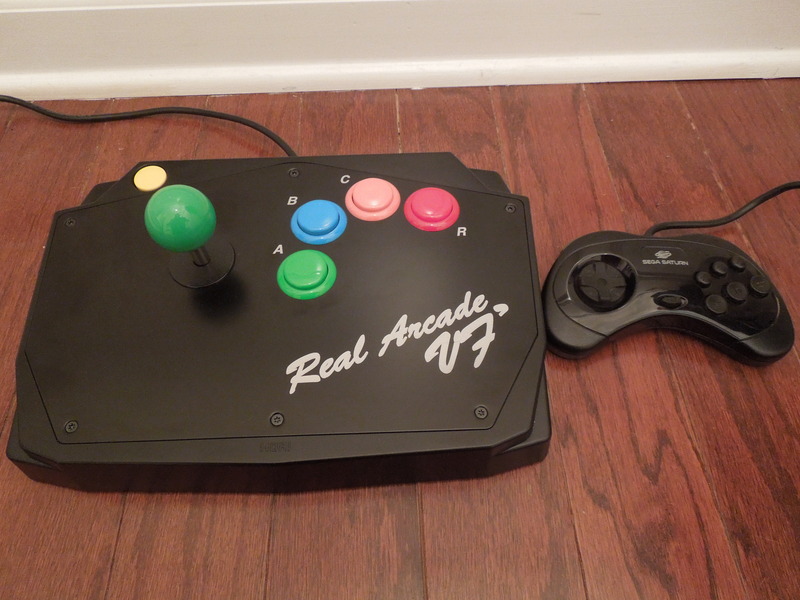 Why is the Real Arcade VF Dash controller obscure? Well, first, there were actually 2 versions of this controller made: The HSS-09 and the HSS-12. The HSS-09 had only 3 buttons (in addition to Start and the control stick): A, B, & C – this version doesn’t include ‘Dash’ in its title. The HSS-12 had only 4 buttons (in addition to Start and the control stick): A, B, C, R. The 3-button HSS-09 is much more common, with many availiabe on ebay and other online stores. The 4-button ‘Dash’ version, however (the HSS-12), is much more difficult to find. I’ve only ever seen one copy ever on ebay, and I bought it new and unused, still in the box (although it’s close to 20 years old) from Japan. If you google it, you may find a used one from an Asian gaming website. I’m not sure why less of the HSS-12 model controllers were made, but there are certainly less than the HSS-09. I could not find much information at all on the Internet about either controller, especially the Dash – I believe both versions were released in 1995. The ‘Dash’ is approximately the same size and weight as the Saturn console. So, why does the controller only have 4 buttons when regular Saturn controllers had 8? The letters ‘VF’ are in the controller’s title, and perhaps this stood for ‘Virtual Fighter,’ a game that was released when the Saturn came out – perhaps this controller was made for that game, and it only needed 3 or 4 buttons to play (I can’t confirm any of this – just an educated guess). I think the lack of buttons is the reason the controller possibly didn’t sell well in Japan, or if it did, why it isn’t known in the U.S. 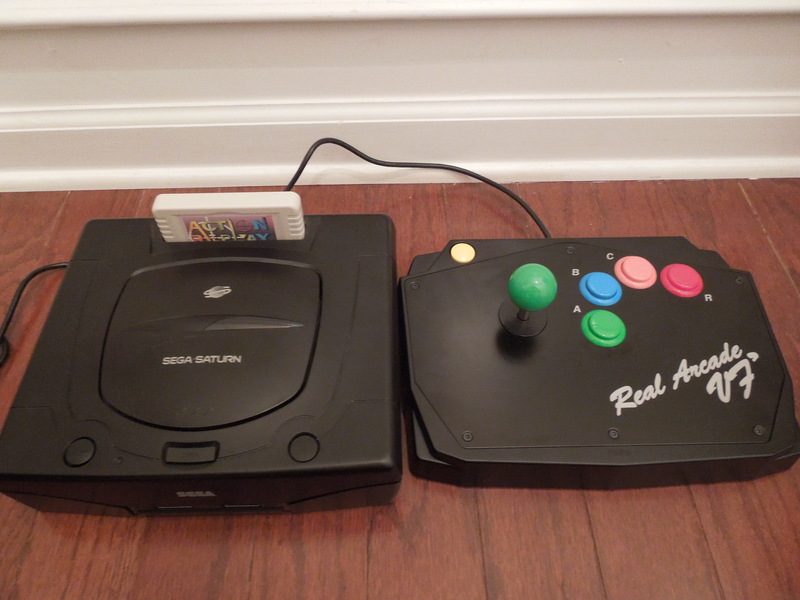 Most Saturn games use more than just buttons A, B, C, and R. Therefore, you aren’t able to play many Saturn games with the HSS-12 (or the HSS-09, which didn’t even have the R button). What happens when you need to press X in Marvel Super Heroes vs. Street Fighter? You can’t because it’s not there! 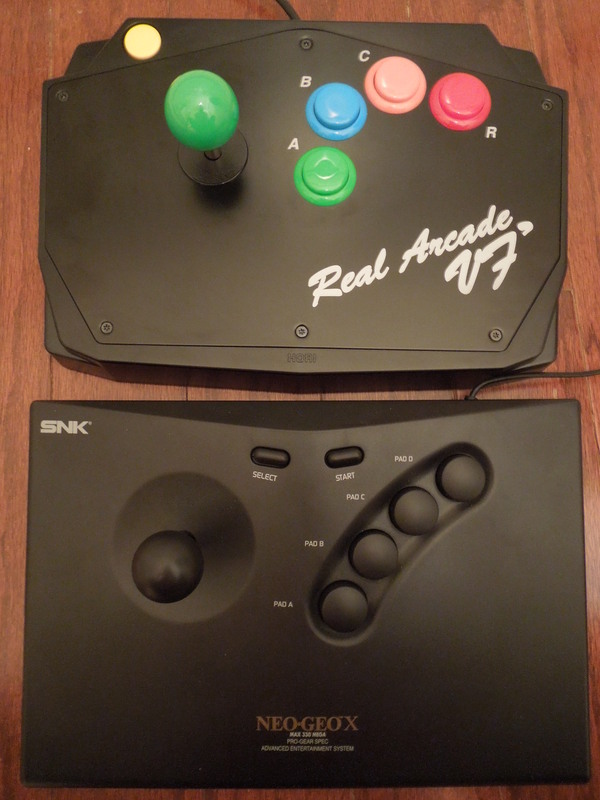 The HSS-12 is approximately the same size as a Neo Geo X controller, yet much, much heavier. Warriors of Fate (only needs A, B, & C). Crows: The Battle Action (technically, the game uses 6 buttons, but you can change the button layout in the Options menu – you don’t need ‘Taunt’ or ‘Block’ – you’ll never miss them. Cotton 2: (only needs A, B, & C). The Controller Itself:…is AWESOME. It is, beyond all doubt, the best video game controller I’ve ever played with. It feels like you’re playing with a stick and buttons from a real, old-school arcade cabinent. The controller is heavy, for starters. The top and bottom plates are made of solid metal instead of plastic. I’m not sure what’s inside, but this is one bulky controller (in the good way). The stick itself works great. It is an 8 way stick that ‘clicks’ in all directions. The 4 buttons – A, B, C, R – are all HUGE, just like arcade buttons, and are great for rapid tapping in Beat ‘Em Ups and Shooters. The controller works great on your lap or on a coffee table in front of you. It comes with a 6 foot cord attached to it, so I recommend buying a Saturn controller extensi0n (really cheap online) if you sit further from your tv. Where can I find this HSS-12/Dash controller? It may pop up on ebay from time to time, but as I mentioned, I’ve only ever seen it once. Doing a broad Internet search may come up with something. You can easily find the HSS-09, which is exactly the same controller, except that it’s missing the R button. Conclusion: This controller is fantastic. Sure, you can’t play all of your Saturn games with it because of it only having 4 buttons, but if you like Beat ‘Em Ups and Shooters, most of those games don’t need the extra buttons anyway. Make sure you do your homework on what buttons individual games use, and if they have an option to change the button layout. The HSS-12 is hard to find, but the HSS-09 is more widely avaliable today – it’s exactly the same, but has only 3 buttons, not 4.